Day two of the 2011 Half Ton Classic Cup supported by South Boats saw the 38 strong fleet racing around the Isle of Wight in a ten hour marathon of mixed conditions and contrary tides. With the race being a non-discard score and counting for double points and the pressure was on and the fleet didn't disappoint. 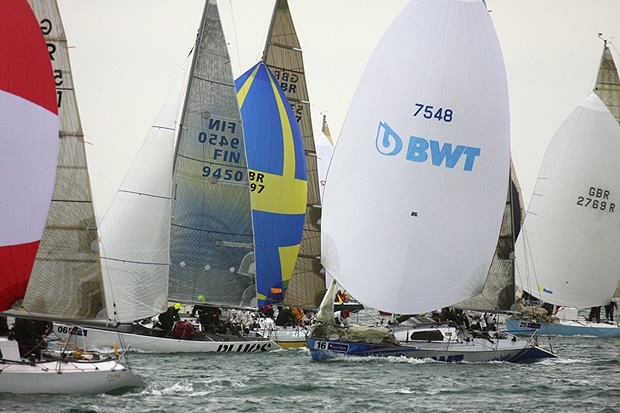 The race started on the Royal Corinthian start line off Cowes at 07.30 in a 10-12 knot northeasterly which got the fleet off to a flying spinnaker reach start. The boats made excellent time out of the Solent and the fleet was still very closely matched as they rounded the Needles with nine boats turning the corner abreast. The wind held up into double figures all the way down the back of the Island to Sandown, but as they headed towards Culver Down the wind started to drop away and by the time they had turned back into the Solent the boats were ghosting along against a building flood tide. Once through the Forts it was a case of trying to dodge the tide while at the same time figuring out how to stay in the elusive bands of breeze. On the final approach to the line the battle for line honours between Robbie Tregear's Per Elisa, Tim & David Cunliffe's Insatiable and Michael Kershaw's Concorde was extremely close. Insatiable took the northern lane in more tide, but with slightly stronger wind, while Concorde and Per Elise held closer to the island shore out of the tide, but in slightly less wind. It was a nail biting finish with Insatiable taking the line from Concorde with Per Elise third. While Insatiable's crew knew they had both Per Elisa and Concorde on corrected time, all eyes were focused back down the fleet as first Michael Kershaw's Chimp and then Francois Michelin's Chani came into the finish. Sadly for Insatiable on corrected time Chani had them by 2 minutes 33 seconds, but they got the better of Chimp which corrected to 2 minutes 3 seconds adrift in third. Back ashore Tim Cunliffe of Insatiable confirmed: "It was really about wind versus tide today. It was a question of deciding whether or not you should stick to the rule of staying out of the tide - or staying in the weakest stream of tide - versus going for the wind and I think possible, for us at least, heading for the wind is what paid over the tide today. That was a little bit of luck that shone on us really. "I think what was demonstrated today was how handicap racing works very well. A lot of people criticise it, but actually we had nine hours racing today, Chani finished 29 minutes behind Insatiable but beat us by less than two minutes on corrected time, which is incredible actually in terms of a race like that. So it does clearly demonstrate that the IRC rule is a very effective system for rating boats and I think that's why the resurgence in the Half Ton Class has been so effective." In the overall standings the first of two possible discards has now come into play and Chimp now moves up from second into the overall lead with 10 points. Chani leaps from fourth to second just 1.5 points off the lead with Insatiable third and counting 15 points. Also jumping up the leaderboard from eighth to fourth is Concorde counting 20 points. Tied on 22 points are overnight leader Philippe Pilate's General Tapioca and Per Elisa with General Tapioca taking fifth on count back and Per Elisa sixth. Also still firmly in contention is Sevcon Team Chia Chia owned by Nigel Waterhouse and Phil Eagleton who lie in seventh place on 25 points. With up to eight more races still to sail the regatta remains wide open. Tomorrow's forecast is for stronger winds, possibly gusting up into the high 20s, and clearer conditions. The fleet will return to racing inshore tomorrow with further windward-leeward races and the possibility of a round the cans race in the pipeline. The regatta continues until Friday 26 August with up to twelve races scheduled.